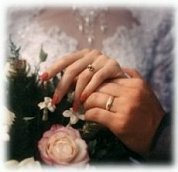 It is a privilege for us here at Saint Christine to assist couples in preparing for marriage. Couples planning to marry in the church are to contact one of the parish priests at least six months prior to the wedding. In order to marry in the church, couples must be free to marry according to the canons of Roman Catholic Church law, and at least one of the parties is to be a member of the parish or from the parish. No wedding date will be confirmed until the couple has met with the priest. He will assist the couple in all aspects of marriage preparation. For your information, the following is contained in our Wedding Policy. Weddings will be scheduled on Saturdays at 12:00 noon; 2:00 pm; and at 6:00 pm. Weddings can be scheduled on weekdays at any time. All engaged couples are expected to participate in a marriage preparation program (see below) prior to the wedding. It is the responsibility of the couple to make the arrangements with the parish priests. All music for the wedding and the related fees are to be arranged through the Parish Director of Music, Ronald Goulish, CAGO (330-792-3829). Additional soloists and/or instrumentalists may be used but only with the approval and under the direction of the Music Director. All music is to follow the diocesan Guidelines for Music at Weddings, and be appropriate to the liturgical celebration, and reflect the church’s understanding of Christian love and marriage. Flowers and decorations may be arranged through the florist of your choice. Decorations are to respect, however, the seasonal decorating in the church. For Christmas and Easter and a few weeks following, flowers appropriate to the season will be in the sanctuary. Through Ordinary Time some greenery or other limited seasonal décor will be in the sanctuary. All seasonal decorations are to remain in place. Questions, concerns and arrangements for sanctuary decorating are to be made through the parish priests. Photographs may be taken and video taping may be done during the ceremony, provided it is done outside the sanctuary area. Group photographs may be taken in church following the ceremony, but not to exceed 20 minutes. The planning of the wedding ceremony; namely, the order of the service, whether with a Mass or not, is to be taken up with the priest. He will assist the couple in planning the liturgy as part of the marriage preparation and answer all questions related to it. Rehearsal dates and times should be arranged beforehand with the priest officiating at the wedding. All those participating in the bridal party should be at the rehearsal, and on time. Rehearsals normally last about 45 minutes. Engaged couples must contact one of the parish priests to book a date and to begin sacramental formation no less than 6 months prior to the proposed wedding date.